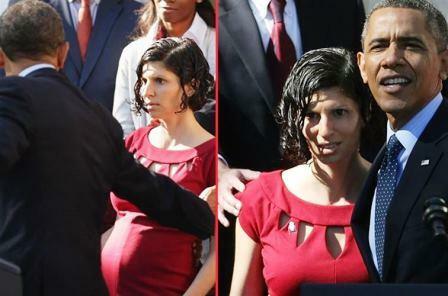 President Obama Fainting Pregnant Woman Catch in Middle of Speech. An act of charity that performed this past Monday. The event took place in the middle of a speech about the Act Affordable Health Care at the White House on Monday 21, the president of the United States give aid to a pregnant woman who was right behind him to faint. Allison Karmell type 1 diabetes and had been invited to the speech , when he began to feel unwell staggered looked around and saw Obama held his arm and said, ” I have you . Such well. “I’m fine , I just had a little dizziness . Thanks @ BarackObama for catch me! And good thing is that this diabetic pregnant 🙂 “. She explains she was there at the speech because she had written a blog post about the ACA and how she stands to benefit from it, and she explained a bit more in her interview with Piers Morgan. Despite what could be considered a very embarrassing moment, Karmel Allison seems to have a good sense of humor about being the face behind the story of Obama’s fainting woman catch.